Awareness Day Is April 6th: What Can I Do? — Bohring-Opitz Syndrome Foundation, Inc.
Thursday, April 6th is the 3rd annual Bohring-Opitz Syndrome (BOS) Awareness Day. The day of denim and gold was created to set aside a special time to celebrate and recognize those with BOS and their families. Many times we are asked, "What can I do to help?" Here are various opportunities for everyone to participate. 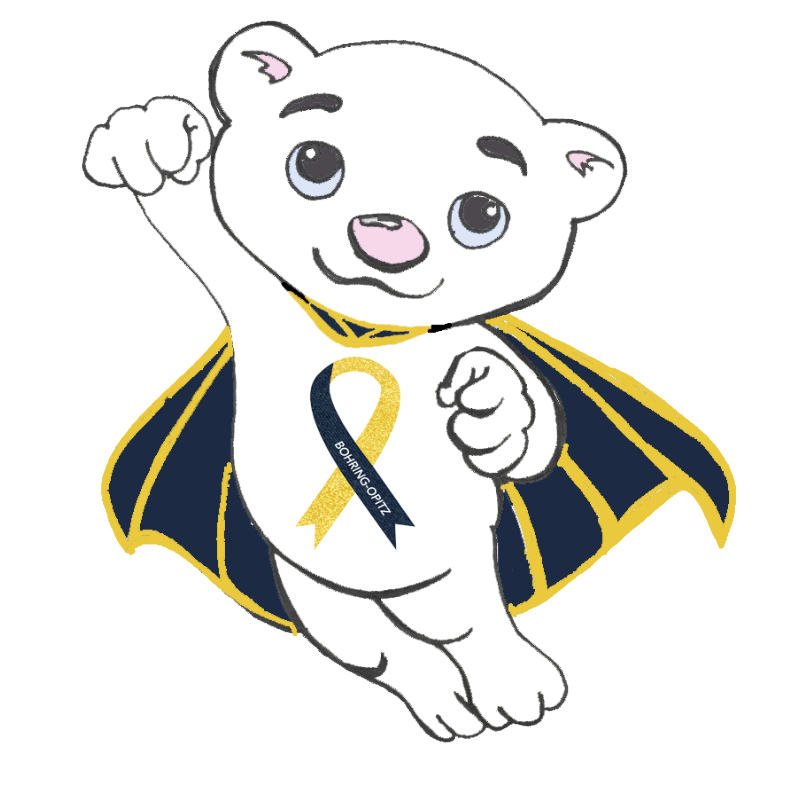 The colors denim and gold were chosen for BOS Awareness Day because denim represents rare disease. Gold was a nice contrast color to the denim since many with BOS have visual problems making high contrast colors easier to see. Gold is also shiny or sparkly to enhance visual attention. People can wear gold (yellow) and denim (navy) on Awareness Day to show their support. The Foundation is excited to launch a new social media campaign this year to spread awareness by posting pictures with the hashtag #BOSAware on April 6th. We hope to get as many people as possible to participate from all over the world. We have a strong international community and can’t wait to see all the love and support for those with BOS and their families. You can help out by sharing the video from our new YouTube account and posting your picture on Facebook, Instagram, or Twitter (or all 3). We will also feature individuals and groups throughout the year on our blog and social media explaining what it means to be #BOSAware. More information can be found by clicking here to see the video. The BOS Foundation is a 501c3 non-profit organization and is 100% run by volunteers. All donations, fundraisers, and grant money go directly to improving the lives of those affected by BOS through the Foundation’s initiatives. There are a variety of opportunities to contribute. You can make a financial donation, participate in Foundation sponsored fundraisers like the ornament and t-shirt sales, and/or by creating your own fundraiser. Some fundraising ideas in the past have included families asking for donations to be made to the Foundation in honor of a BOS child’s birthday and events like auctions and individual t-shirt sales. If you are interested in hosting a fundraising event, contact us for more information. Members of our BOS community have organized events in honor of Awareness Day over the past two years. Some of these have been casual gatherings at a local restaurant, a happy hour, and fundraisers. These provide an opportunity to spend time together with family and friends to celebrate their loved one with BOS. One of the most important components of awareness and advocacy in the rare disease community is to tell your story. There are several opportunities to do this including submitting a story for our website or other online resource such as Global Genes, The Mighty, or creating your own blog. Some members of the BOS community have created Facebook pages or groups that chronicle their journey with BOS. Even sharing a paragraph or two on social media might help someone on a similar journey. Sharing your story brings a personal connection to the daily experience of living with or caring for someone with BOS. We have a specially designed BOS Coloring page for Awareness Day that is a fun and engaging way to learn more about BOS. Teachers, parents, and therapists can use this as a learning tool to start a conversation about BOS and rare disease in general. For those with BOS, it would be a great activity for their classmates and/or friends and family members to participate in with them to show your support. You can request awareness items from the Foundation. These include stickers, wristbands, ribbons, and awareness cards. These are nice to have to hand out to educate other about BOS. We also offer t-shirt sales throughout the year, so wearing your BOS superhero shirt might help start a conversation. Some parents have had additional items made such as postcards that have a brief description of their child and BOS. These have been useful to hand out at doctor appointments, advocacy events, or other times when a conversation about BOS comes up. These aren’t provided by the Foundation, but if you’d like more information contact us. The Foundation is working on Rare Rounds, a program designed to teach medical students about Bohring-Opitz Syndrome. Taylor Gurganus had the opportunity to participate in Children's Hospital Grand Rounds as one of four families speaking about rare disease. This is in the initial phase of development, but if you are interested in learning more, please contact her at taylor@bos-foundation.org. We have created a new BOS Clinical Features document thanks to many in our community who submitted pictures. This was a highly popular item for geneticists at the recent ACMG conference in Phoenix. You can download it from our website here if you’d like to print copies. Having materials like this and some of the other awareness items is helpful, especially to take to new doctor visits and advocacy events. We are currently on Facebook, Instagram, Twitter, Pinterest, and now YouTube! By following us and sharing our posts, it helps us reach as many people as possible. This is also an excellent way to keep up to date with the latest information and events the Foundation offers. You can also sign up for our newsletter and email list here. We are always looking for people to volunteer to help with the Foundation. Currently, we are looking for a Director of Fundraising. There are also opportunities to volunteer for the Research and Medical Advisory Committee and Awareness Committee. Many times we also need help with making ribbons or other items for our awareness and patient support materials. If you are interested in any of these opportunities, please contact us for more information. Being an advocate can mean many things. As a parent advocate, you are often the voice of your child and work toward ensuring they receive the best care and services possible. This opens the door for awareness as a whole when you interact with your child's daily needs as someone with BOS. Advocating on a legislative level is something members of our BOS community have done through participating in events such as Rare Disease Day. Awareness is a year long activity and we are always open to new ideas on how to spread our knowledge and experience with BOS. If you are interested in volunteering for the Awareness Committee or have questions about any of these activities, please contact Taylor at taylor@bos-foundation.org.